Mahamaya (Chin. mo ho mi; Mo-ho-mo-ye) is a term used Hinduism, in Shaivism and in tantric Buddhism. In Hinduism is Mahamaya associated with Shanti Durga, sometimes also with Bhuneshvari. She is the ultimate formless form of the divine supreme Shakti and not the dark unpure Maya. She is especially mentioned in the Kalki-Purana and also in the Bhagavata Purana. She is older than Maya.She is the godess who destroys the basis of the illusion. She creates and destroys Maya. She emanates 7 mothers (like Chamunda) to destroy the evil forces of the Asuras Shumbha and Nishumbha (Devi Mahatmyam) . In the mantras she is the "ee", the divine ether or the divine essence. The Devi Bhagavatam also distinguishes between Suddha Mâyâ and Avidya Maya (Pure Maya and unconscious Maya). Therefore, the concept of a Mahamaya also exists as a synonym for a Chit-Shakti  or Svarupa-Shakti (Svarūpa-aktakti) .Only in a special manifestation she it the Lila-Shakti or Yoga-Maya. Mahamaya is also a higher aspect of Parvati . She later unites with Shiva in its cave and becomes mahamaya(U.Path 17). In the Shaiva Siddhanta, a distinction is made between pure and impure Maya, just as in the Kashmirian Shivaism. Pure Maya is all below the Paramshiva up to the Ishvara-Tattva. The unclean Maya corresponds here to the dark Hindu - Maya. Kshemaraja equated Mahāmāyā with the Sunyata, which after the Swacchanda Tantra has several levels up to the Paramshiva. The Theravada knows only a Maya as the mother of the Buddha Gautama and wife of the king Shuddhodana, who is sometimes called Mahamaya. In the apocryphal Lalitavistara Sutra of Mahayana, Buddha's mother is a heavenly Mahamaya. In tantric Vajrayana Mahamaya is Gyuma Chenmo(Tib. : gyu ma chen mo). According to a tantric legend, Maha Maya was supposed to have dreamed of a white elephant, who entered six tusks into her right side. This was interpreted as having a child who would become either a worldruler or a Buddha. After 10 lunar cycles she felt that the time of birth was near, and she went to the Lumbini Grotto outside of Kapilavastu. As she stood upright and held on a branch of a Sal - tree, the child came out from under her right arm. Seven days after birth, she died and was reborn in the heaven of the 33 gods (Tavatimsa Heaven). 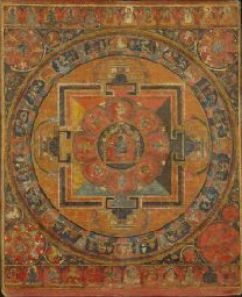 The buddhist Mahamaya - Tantra (Sanskrit: Mahāmāyā-tantra) is a tantra associated with the dreamyoga with peaceful and also so-called terrible aspects, which originated in the thirteenth century in the Shangpa-Kagyu.